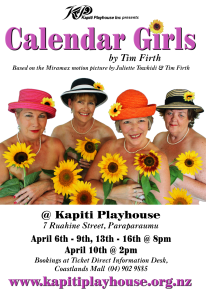 Calendar Girls - Kapiti Playhouse Inc.
6th-9th April, and 13th-16th April at 8pm. 10th April at 2pm. 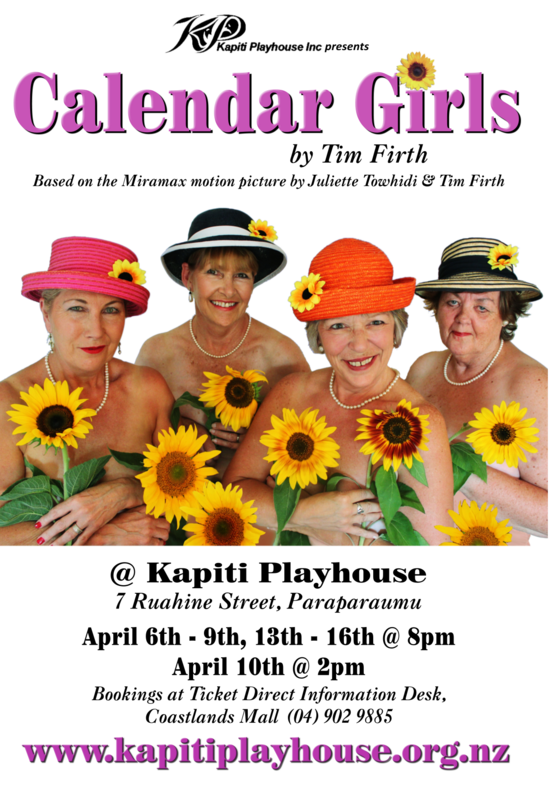 Tickets will be available from Coastlands Ticket Direct Information Desk or by calling 04-902 9885 from 14th March 2016. Adults $22, Students/Senior Citizens $20, Groups of 10 or more $20. Tickets also available online from the TicketDirect website. Please note additional fees may be charged for tickets purchased online. Update 29th March 2016: All tickets are now SOLD OUT! Apologies to those who missed out. Update 31st March 2016: Extra performance on Tuesday 12th April now on sale.